Willow Chang is today's MUVE-Along Show Guest. Willow was born and raised in Hawaii and has studied a wide variety of dance styles such as Hula, Middle Eastern belly dance, Arabic and Egyptian styles, Lebanese and Turkish, tribal fusion, contact improv and modern dance, contemporary and what she likes to call theatrical dance. She's a jack of all trades and today will show us some simple moves from her vast bag of tricks. The MUVE Along Show aims to animate television watchers to get up and dance right in front of the TV or computer. You can do it too. Move along as Willow leads Maggie in the studio and the television audience at home. Traditional Korean Dance with Mary Jo Freshly – Spontaneous Dance-along! At today's MUVE-Along Show teacher Mary Jo tells us about the different genres of Korean dance: Court dances, Mask dances, Drama dances, Buddhist influenced dances, Folk dances, Farmers dances. She learned Korean dance from her teacher Halla Huhm. Mary Jo demonstrates very simple basic movements for our first dance along. Then we do a dance with "Sleeves" which comes from Masked Drama dancing. For our last dance host Tiny requests a spontaneous dance to the music of the Pointer Sisters. Mary Jo is a good sport and we use Korean dance movements set to the pop song "Fire." Spontaneous Sing-along with Scott Smith – Make the Joy of Music Your! Today Maggie has invited Scott Smith, a professional entertainer, to inspire the home audience to sing along to some old time favorites. To support the mission his mom Serafina has come along. Dancing and singing are wonderful ways to relax and find joy. And "doing it" is so much more fun than just "watching" or "listening!" MUVE-along Show 07/11/11 (abridged). Today's guest Shadiya teaches Middle Eastern Dance in Honolulu. She is showing us some basic moves to dance along at home. Shadiya's alluring grace and charismatic artistry capture the essence of authentic Middle Eastern Dance, transporting audiences to the sights and sounds of the mystical Orient. Dedicated to the instruction, presentation and promotion of authentic Egyptian-style and North African dance, Shadiya is skilled in a variety of styles such as Saidi Folk dancing from Southern Egypt; the Ghawazee dance of the Banat Maazin from Luxor, Egypt; the ancient tribal dance of Algeria's Ouled Nail, as well as the contemporary cabaret solos of modern Cairo. For eight years Shadiya was the principal dancer for the Near Eastern Dance Company of California, founded in 1982 by Alexandria of Berkeley, California. In 2001 Shadiya began teaching and performing, establishing her first perfomance troupe, The Near Eastern Dance Company of Hawaii. Shadiya has also served as the 2004 and 2010 president of the Middle Eastern Dance Artists of Hawaii (MEDAH), a non-profit organization established to educate, entertain, and promote awareness and appreciation for the art of Arabic dance. LIVE MUVE Show 06/13/11 (abridged). Dance exercise at home right at your computer, it will refresh your mind do your body good! MUVE dance is always improvised. It's a fun way to exercise for kids, teenagers, adults and seniors. You won't even notice that you are doing cardio exercises. Today Michael Cahill is teaching us moves inspired by the dances of Guinea in West Africa. This should get your heart rate elevated and your oxygen flowing in your veins. Moving to music is healthy and fun. Especially when you know you cannot do it wrong. This is cardio funk aerobic dancing for your living room. Go ahead and do it, it's super easy to follow and will make you feel good. LIVE MUVE Show (abridged). Today House dancer Lyanne brought her friend Linda who teaches Hip Hop and Street dancing. Both ladies teach dance classes for children, teens and adults here in Honolulu. They are also instrumental in organizing the events for National Dance Week in Hawaii. First Lyanne is taking us through some simple dance routines in the House style. Maggie and the audience at home get their easy cardio workout by following loosely -- It's the MUVE style! Then Linda shows us some of her Hip Hop dance steps. Go ahead and try it! As always with MUVE, you can't do it wrong. MUVE dance is always improvised. It's a fun way to dance exercise for kids, teenagers, adults and even seniors. We want to show you very simple moves you can use on any dance floor, at home or at any party or cub. You won't even notice that you are doing cardio exercises. LIVE MUVE Show 05/16/11 (abridged). Linda Kou and Lyanne Brooks, who showed us Hip Hop and House moves last week, are two of the key organizers of the National Dance Week here in Hawaii. They brought three guest performers and teachers from New York to promote the free classes that are offered throughout the week in various locations around the island. Detailed class and event schedules are available at www.ndw-hawaii.org. Neil "Dradle" Schwartz teaches Hip Hop and Jazz and Melanie Aguirre teaches "Whacking", "Voguing" and house dancing. Then we meet legendary house dance pioneer Ejoe Wilson. The three star teachers get down with Maggie for an improvised MUVE-style dance along. They are keeping it simple so the audience at home can join in the fun. Ejoe invites the viewers to a dance party at 39 Hotel Street on Friday 5/20/11 starting around 10pm in Chinatown Honolulu. He promises performances and lots of dancing for everyone. LIVE MUVE dance-along Show 02/21/11 (abridged). There is no school on President's Day, and that's why we get to dance exercise with little Allen (4) and Rachel today. Both love to MUVE and have no problem leading as a Muse. Maggie sets up a "Muse-Triangle" on the floor with stickers, and off they go. The person on the spot in the front creates the easy movement idea and the others follow "loosely." As always, you are invited to get a simple dance workout with us, right now, right here. A Muse-Triangle lies at the base of most MUVE Dancing Games (MDG.) These dancing games can be played with 2 or 22+ dancers. They make a fun physical activity for any party. MDGs can provide a quick break in between academic study periods right in the classroom! Anyone can do it, no matter the age or shape they are in, because all adjusts their movements to they own liking. If you want to see a whole school class dancing a MDG, check out https://muve.org/blog/school-muve You can download the instructions to this and other MGDs from the muve.com website for FREE! The first song is called "Banana Phone" by musical artist Rafi. Then we are groovin' to a Stevie Wonder song. Go ahead and do it! It is so much fun, just give it a try! Show 01/03/2011- abridged. First Show at the new time slot every Monday at 8am. Guest in the studio is Rose who had a great career in Musical Theatre in Germany. Obviously she is no stranger to dance improvisation. She is happy to lead our simple dance routines. MUVE originated in Honolulu, Hawaii in 1998. It's mission is to inspire people of all ages to feel free to dance without the complications of choreography. First video of the show is "Be Okay" by the musical artist Ingrid Michaelson. The video shows Maggie and a group of MUVERS animating the audience of the Senior Expo in November 2010 with easy dance exercises to increase flexibility in a joyful motion dance. Join us for these senior fitness exercises on stage at the Honolulu Blaisdell Exhibition Hall. MUVE is a great way to enjoy quality time with your fiends and together staying motivated to exercise. 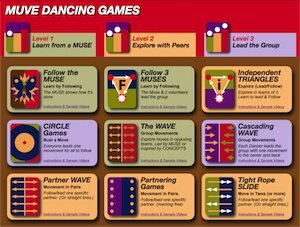 MUVE dance-alongs are stress relieving games for groups and families. For your personal quick and easy workout, the video blog is available 24 hours a day. Next Rose and Maggie switch lead in a live dance-along for the home audience. Maggie shows the "Office MUVE" videos series on the blog specially created as a desktop stress reliever for anyone stuck at the computer for hours. The easy workout routines of the Office MUVE series are low impact cardio exercises that can be done right at your computer. MUVE Dance-along Show 12/30/2010 abridged. 3 children dance exercise to the Family MUVE, one of the MUVE dance workout dvds available at www.muve.com. MUVE videos are simple dance routines anyone can dance along with, no matter your shape, age or size. Little Allen discovered MUVE at the age of 2 in 2009. He loves to MUVE and is especially fond of being the lead dancer (Muse.) Maggie shows his progress with a more recent video from September 2010, where he is leading a group of dancers of all ages on stage and in the audience. Then we see Maggie and Allen on the Hawaii News Now Morning Show, introducing anchors Dan Cooke and Steve Uyehara to a MUVE dancing game. Both turn out to be great sports. They invite the home audience to join in with the freestyle dance moves. Especially during the holidays, dancing workouts can help counterbalance the heavy eating. The simple dance moves of the MUVE dance exercise videos can help staying motivated to exercise at home. Joyful dance also is stress relieving. To inspire your whole family to dance for better health, you can download the instructions to the spontaneous MUVE Dancing Games (MDG) for free from the muve.com website. MDGs can be used as disco party games or to animate group dancing at weddings and other parties.